Over the next 15 years, the international community will be guided by 17 Sustainable Development Goals (SDGs) integrating the three broad pillars of sustainable development: economic, social and environmental well-being. Universal in nature, this means the SDGs will go beyond guiding the international cooperation efforts of high-income countries and emerging economies, to encouraging Canada to determine how it will address its own sustainable development challenges domestically. We made it! After three years of inter-governmental negotiations, consultations with millions of people worldwide and thousands of inputs from experts, United Nations' (UN) member states will adopt Transforming our Lives this week at the UN Summit to adopt the Post-2015 development agenda. In doing so, states will agree to a new agenda for global sustainable development, replacing the eight Millennium Development Goals (MDGs) that expire at the end of this year. Over the next 15 years, the international community will be guided by 17 Sustainable Development Goals (SDGs) integrating the three broad pillars of sustainable development: economic, social and environmental well-being. So, what are these global goals all about? And why should Canada and Canadians pay attention to them? Looking forward, the goals represent a broad and comprehensive vision for global and national efforts on sustainable development -- a sort of new global social compact between the world's governments and its citizens. They expand on the unfinished business of the MDGs -- which largely focus on social aspects of development such as health, gender equality and education -- to include much greater attention to issues related to the environment and climate change, employment, economic growth, inequality and peace and security, inter alia. They reflect the challenges countries face at the national level, such as ensuring quality education for all. And like the MDGs which guided development efforts over the past 15 years, the SDGs will serve as the framework for sustainable development efforts going forward, impacting plans and priorities at a regional, national and local level. And they draw attention to a range of global public goods which require collective action, such as addressing climate change and promoting a fair, rules-based trading system. The adoption of the SDGs, therefore, provides impetus for Canada to re-examine existing priorities for development cooperation in light of this new global agenda, as well as to enhance the leadership it plays and the contributions it makes to addressing global public goods. Global challenges no longer respect national borders, and Canada must play its part. In addition to expanding the agenda from the MDGs, the SDGs have also been billed as representing a paradigm shift in other important ways, with implications for Canada. Unlike the MDGs, these new global goals are universal in nature, applying to all countries, not just developing ones -- as much to Cameroon and Costa Rica as to Canada. This means the SDGs will go beyond guiding the international cooperation efforts of high-income countries and emerging economies, to encouraging Canada to determine how it will address its own sustainable development challenges domestically. Notwithstanding the substantial capacity and resources available in high-income countries, a recent study by Bertelsmann Stiftung shows that high-income countries will have their work cut out for them to realize the SDGs at home. Canada is no exception. Importantly, the universal agenda is for all people. While the success of the MDGs was understood in terms of overall progress, the SDGs have a significant focus on leaving no one behind. We will not be able to say that the SDGs have been achieved unless they are achieved for all people everywhere. For Canada, this will mean tackling the ongoing marginalization and inequalities faced by minority groups in Canadian society, indigenous populations in particular. As one study examining how the SDGs could be applied to Canada shows, indigenous peoples fall behind in terms of their experience of economic, social and environmental well-being when compared to the rest of the Canadian population. Women, immigrant populations, individuals with disabilities and others -- including refugees, as the Syrian crisis has shown -- also continue to face discrimination and inequality in Canadian society. Realizing the SDGs in Canada for all people will be no easy feat will mean acknowledging highly political realities, tackling structural and systemic inequalities and working across sectors with representatives of different national and international groups to find sustainable solutions to deep-rooted challenges. Over the coming weeks, the Canadian Council for International Co-operation and the Canadian International Development Platform (CIDP) are collaborating on a blog series aimed at unpacking the ins and outs of the SDGs and their implications for Canada. The blogs will feature commentary on Huffington Post Canada's Development Unplugged. Contributors will comment on the overall success of the SDGs, looking at where wins exist and where the agenda falls short. They will also highlight the implications for Canada -- both in terms of domestic policy and international cooperation. The series will start with a few broad assessments of the outcomes and their implications, followed by commentary on each of the 17 goals from experts in the field. 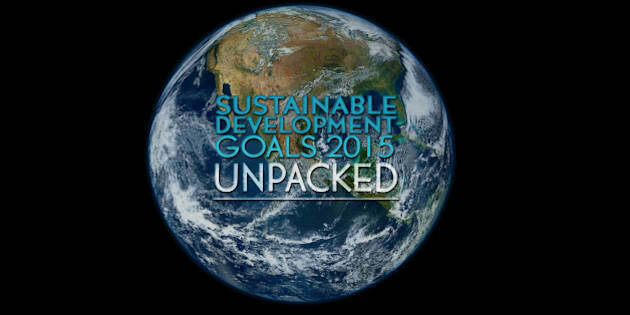 Stay tuned as we unpack these #GlobalGoals in the weeks ahead! Shannon Kindornay is an Adjunct Professor at the Norman Paterson School of International Affairs at Carleton University. Fraser Reilly-King is the Senior Policy Analyst at the Canadian Council for International Co-operation.